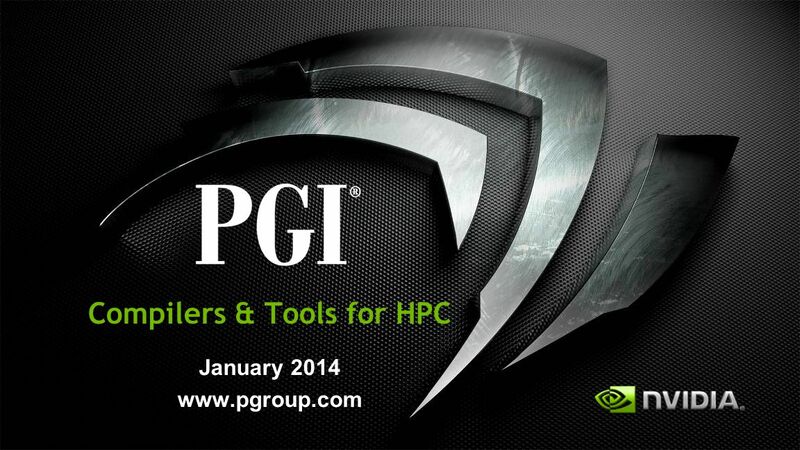 Compilers & Tools for HPC January 2014 www.pgroup.com. 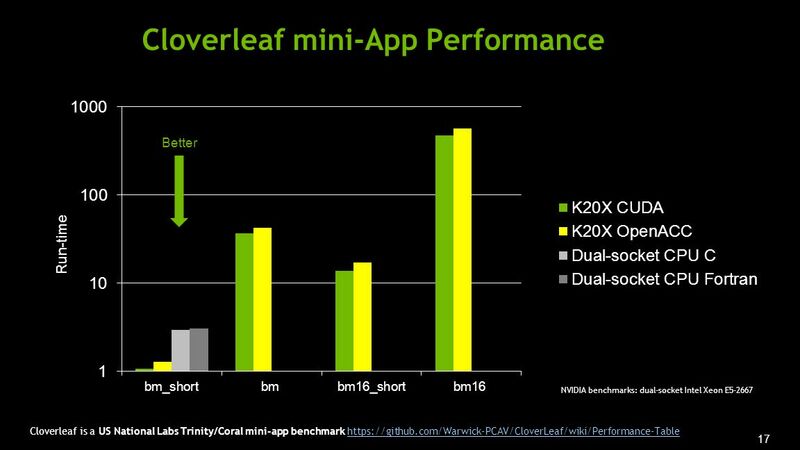 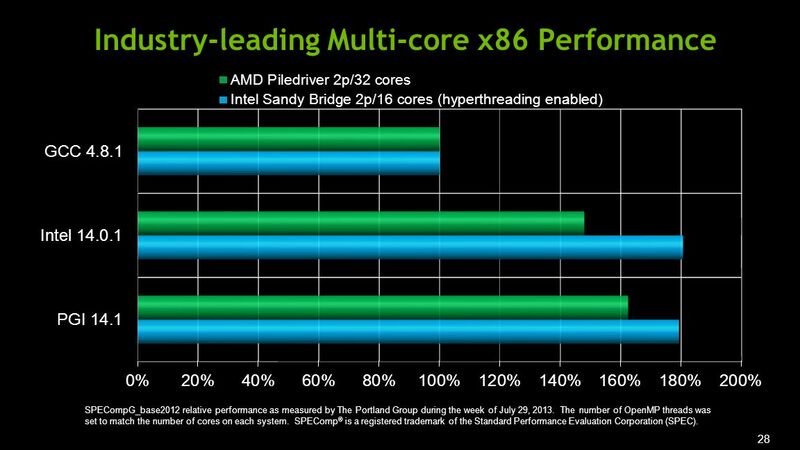 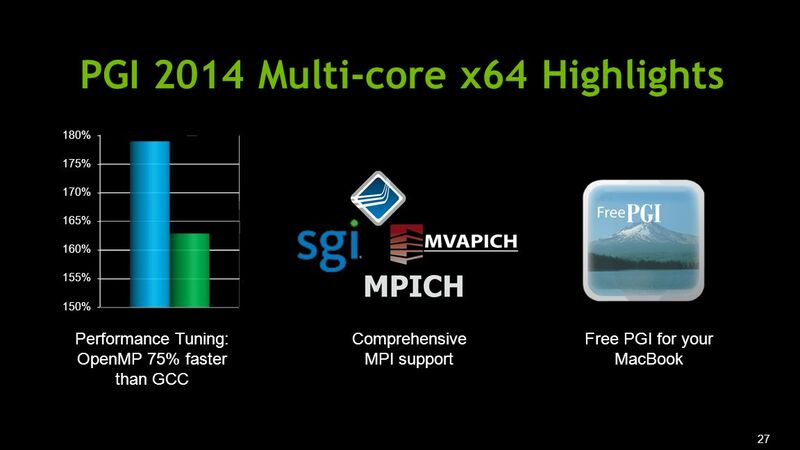 28 28 Industry-leading Multi-core x86 Performance SPECompG_base2012 relative performance as measured by The Portland Group during the week of July 29, 2013. 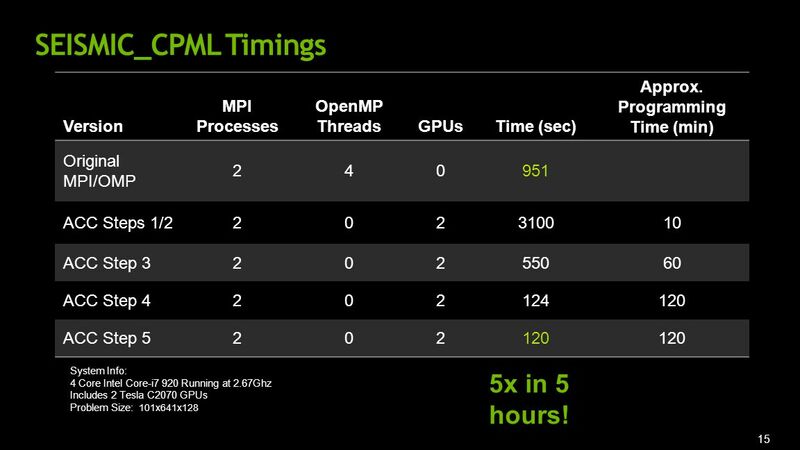 The number of OpenMP threads was set to match the number of cores on each system. 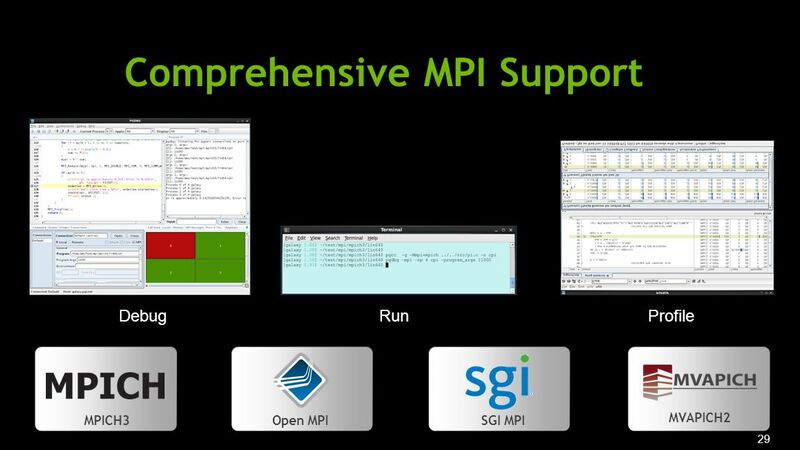 SPEComp ® is a registered trademark of the Standard Performance Evaluation Corporation (SPEC). 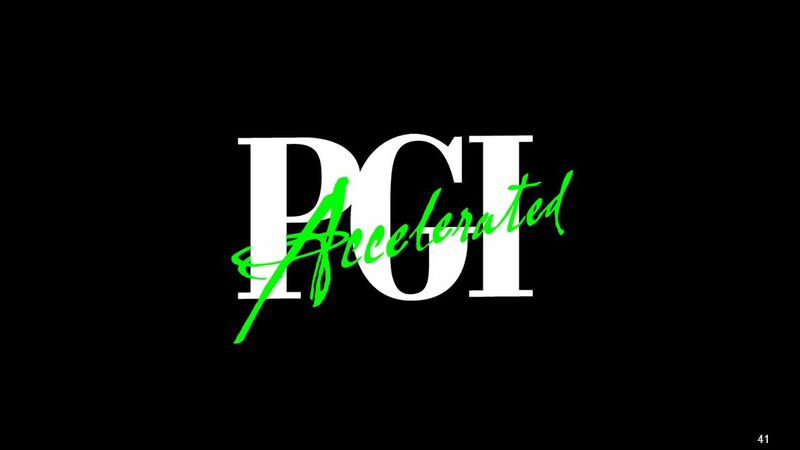 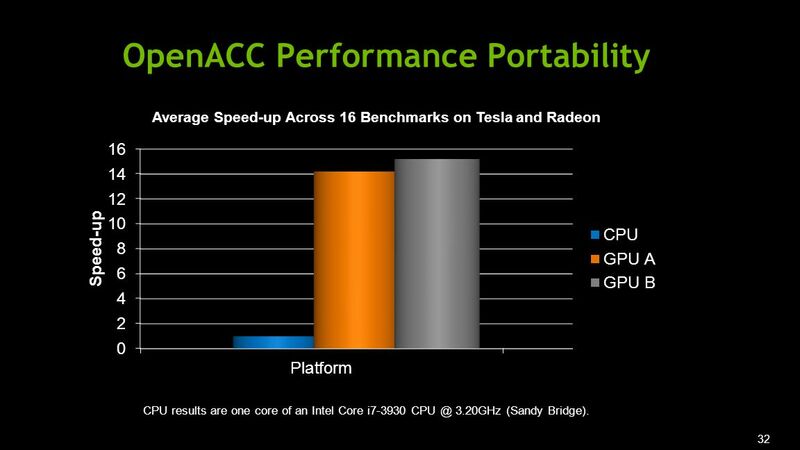 32 32 OpenACC Performance Portability CPU results are one core of an Intel Core i7-3930 CPU @ 3.20GHz (Sandy Bridge). 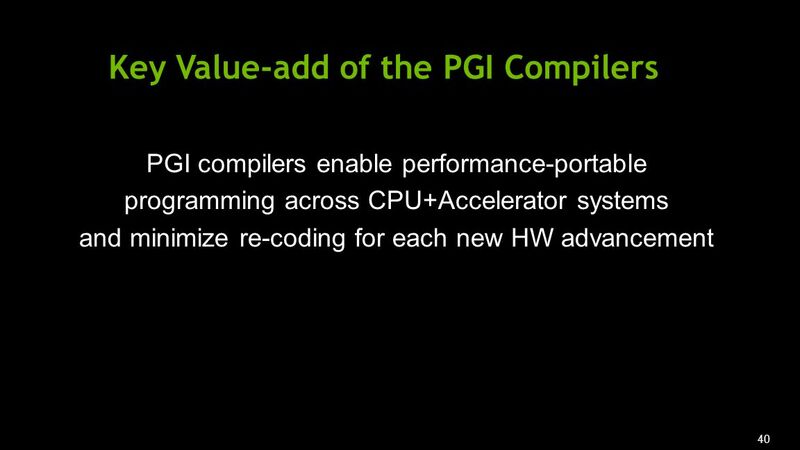 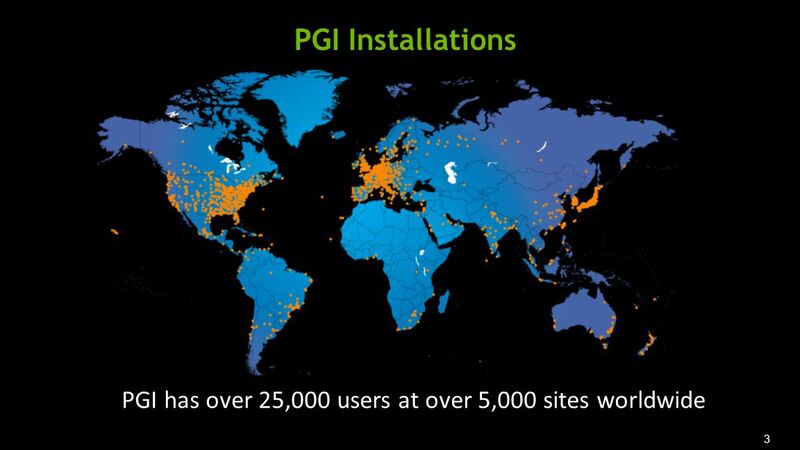 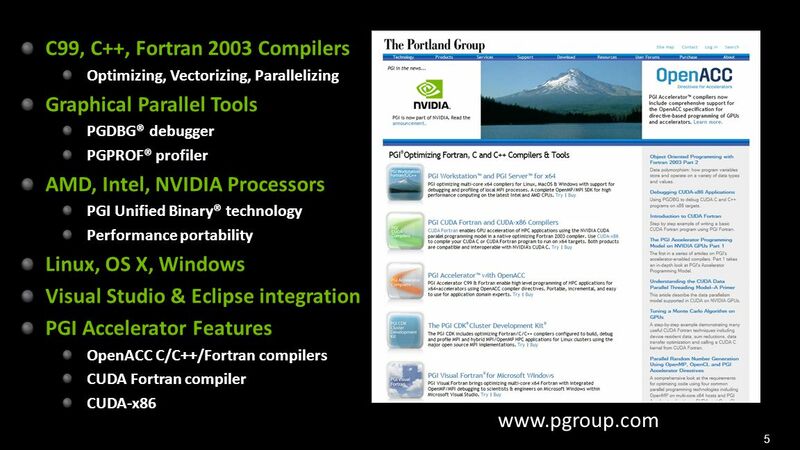 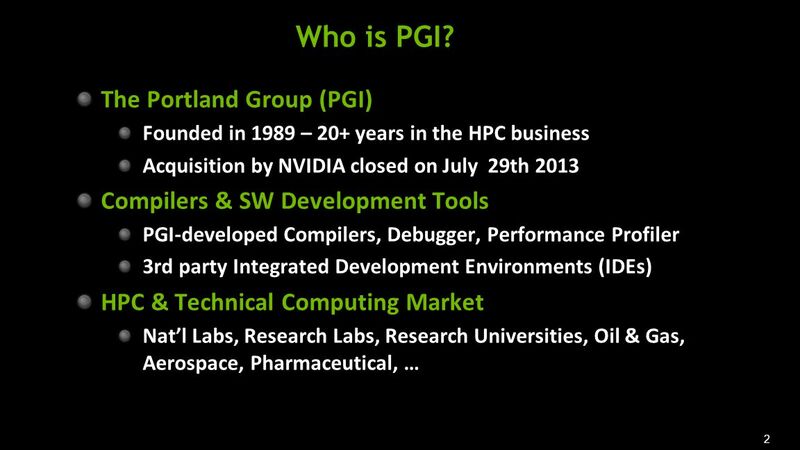 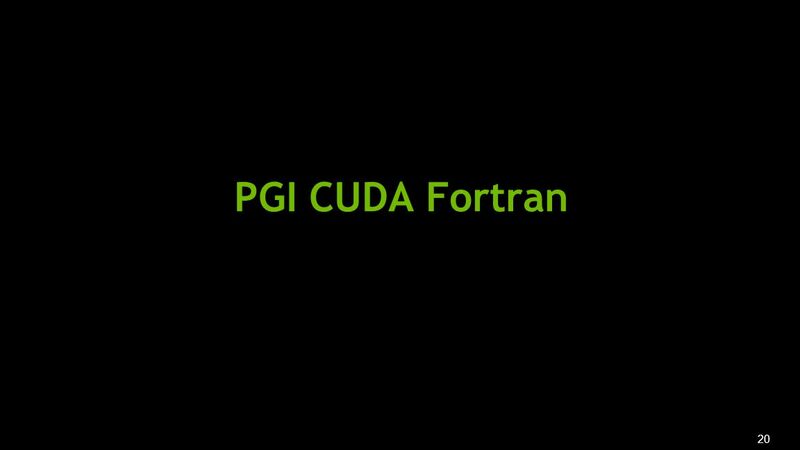 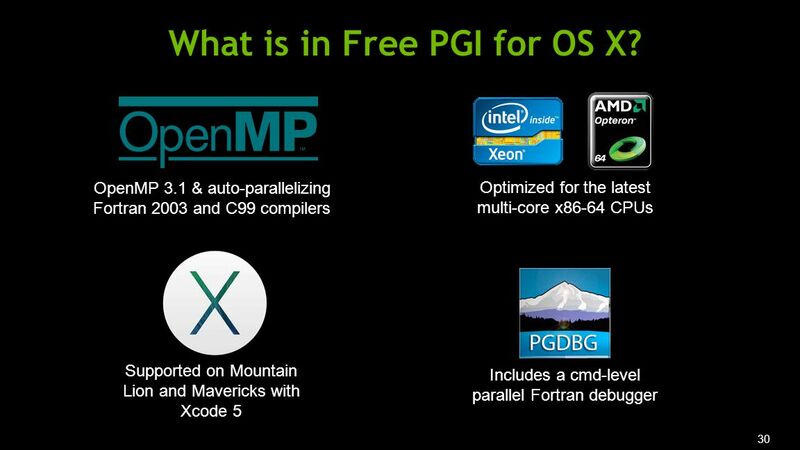 Download ppt "Compilers & Tools for HPC January 2014 www.pgroup.com." 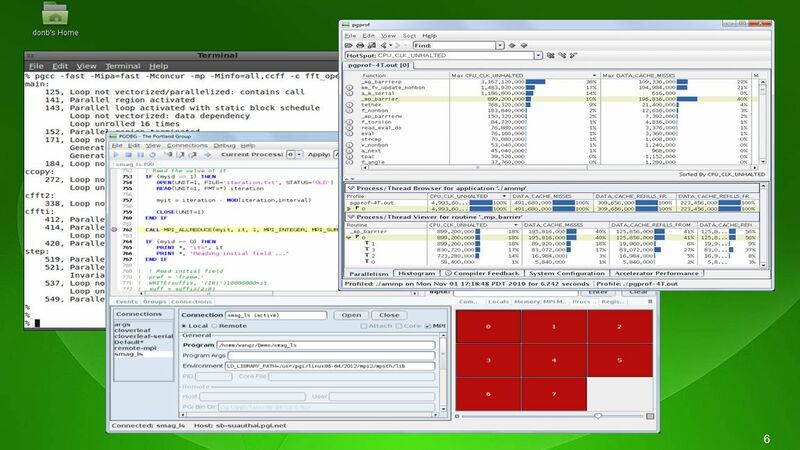 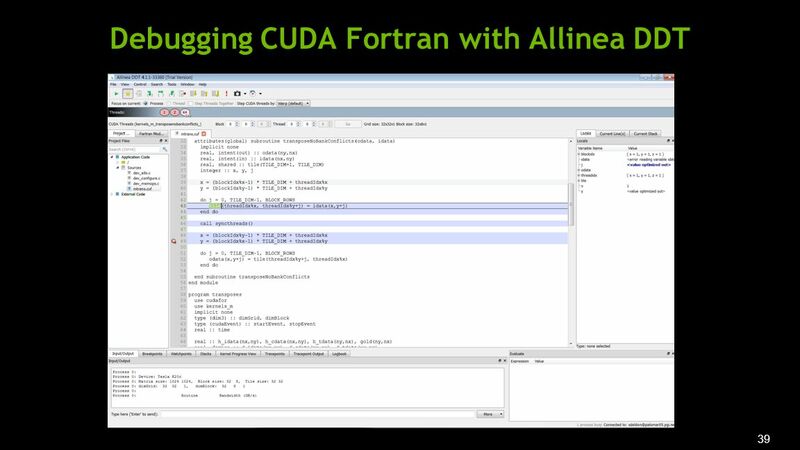 Intel Software College Tuning Threading Code with Intel® Thread Profiler for Explicit Threads. 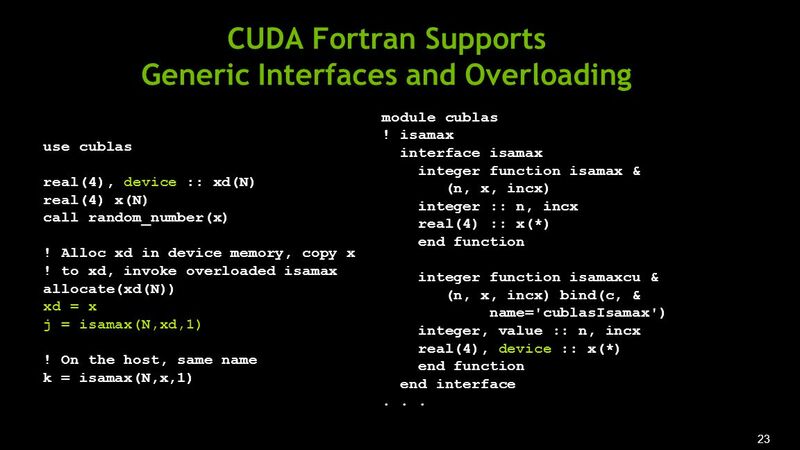 CUDA More on Blocks/Threads. 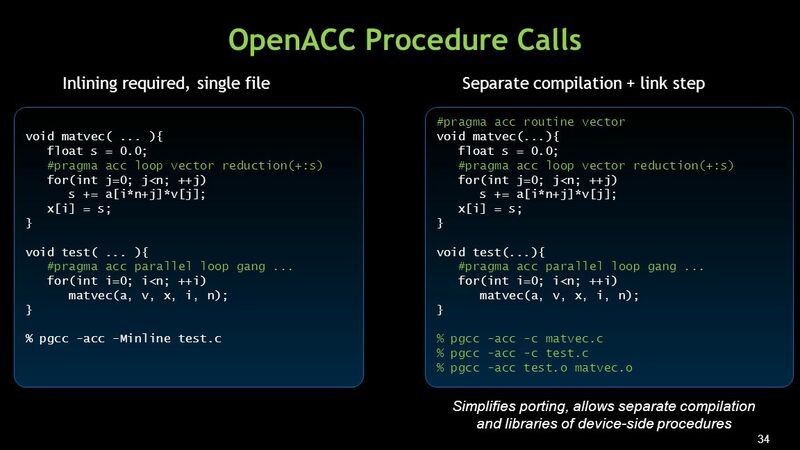 2 Debugging Using the Device Emulation Mode An executable compiled in device emulation mode ( nvcc -deviceemu ) runs completely. 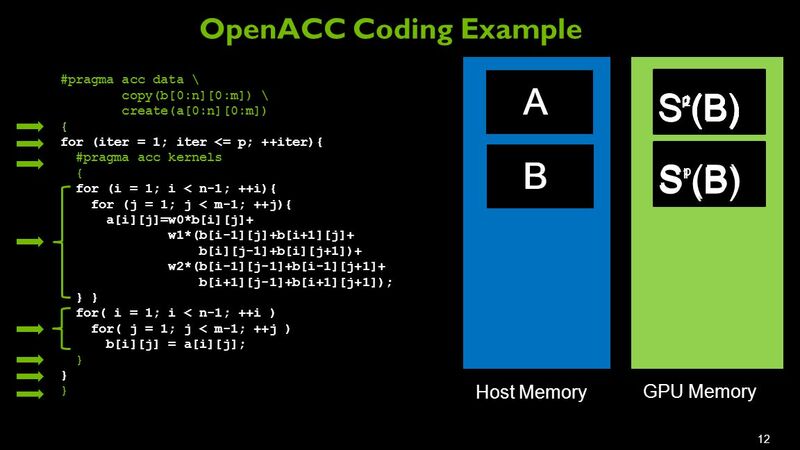 Accelerated Linear Algebra Libraries James Wynne III NCCS User Assistance. 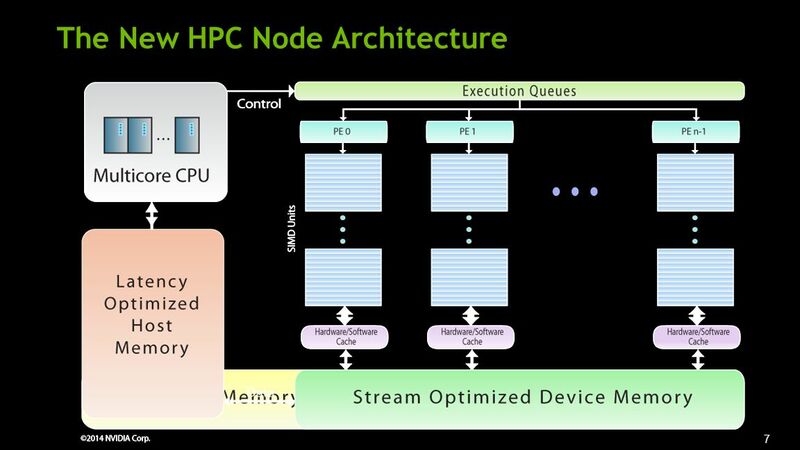 Complete Unified Device Architecture A Highly Scalable Parallel Programming Framework Submitted in partial fulfillment of the requirements for the Maryland. 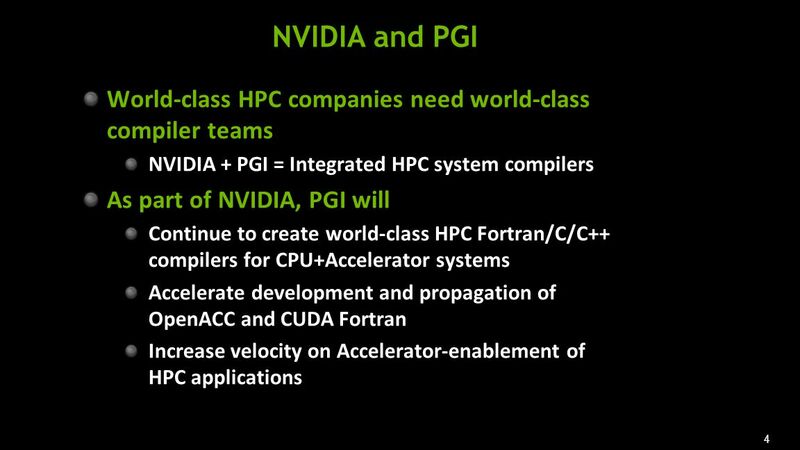 VSCSE Summer School Programming Heterogeneous Parallel Computing Systems Lecture 6: Basic CUDA and MPI. 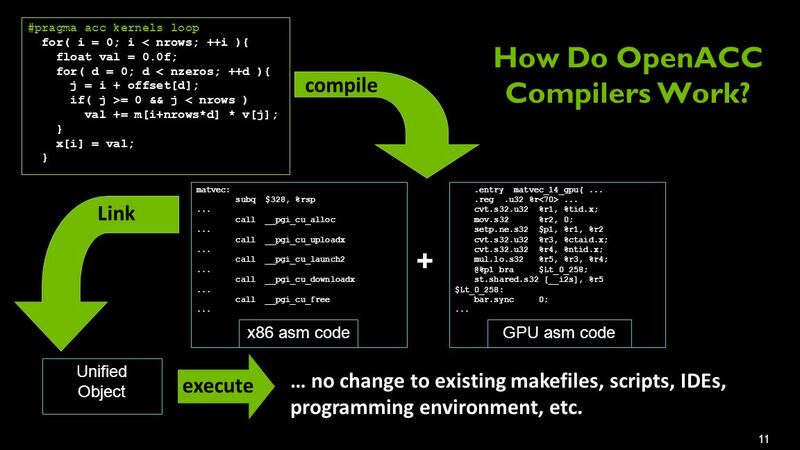 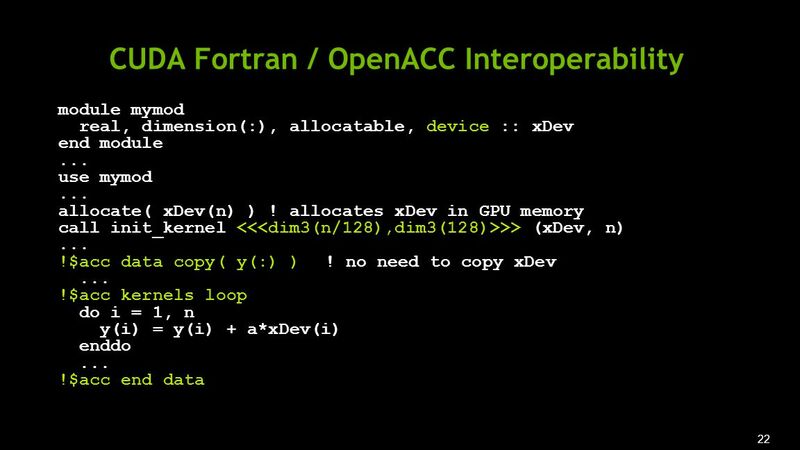 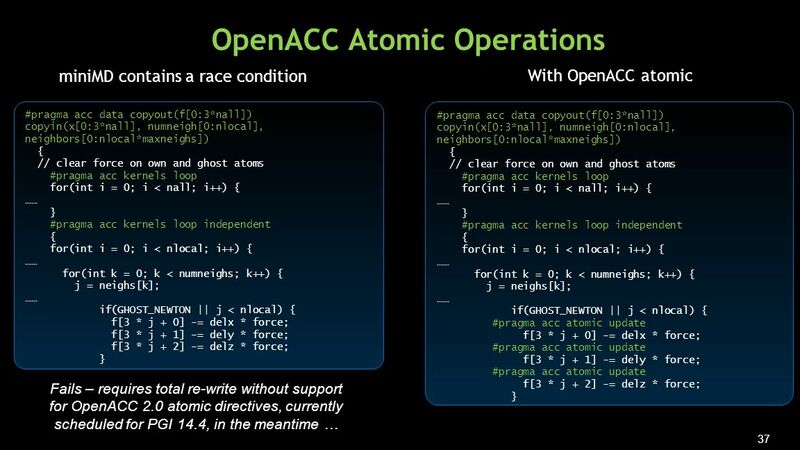 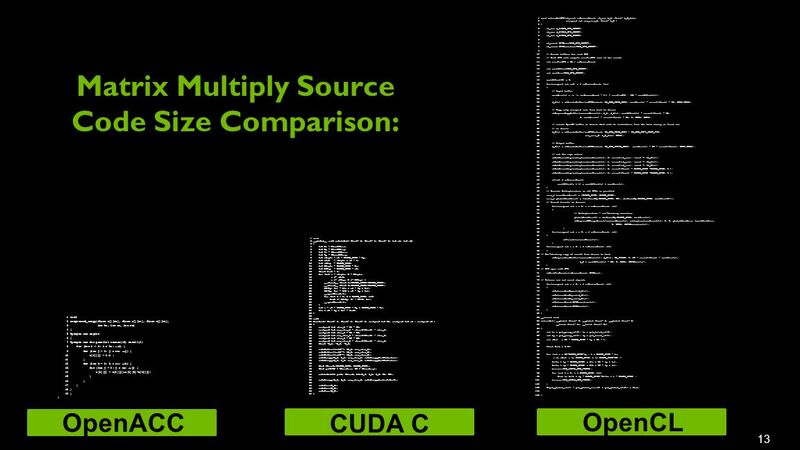 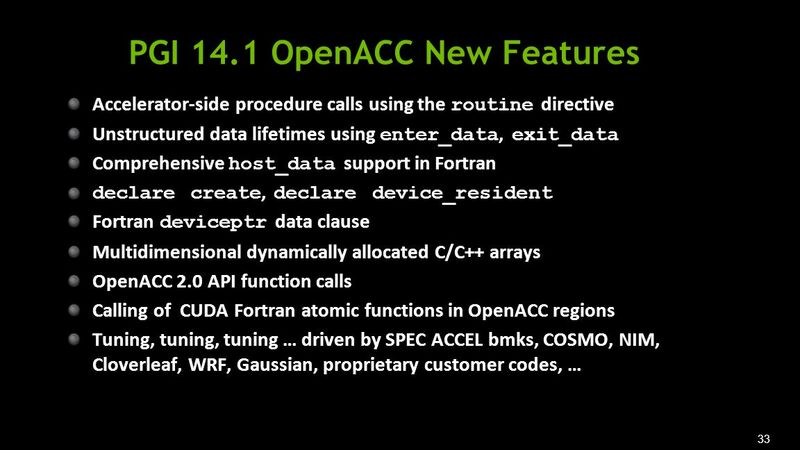 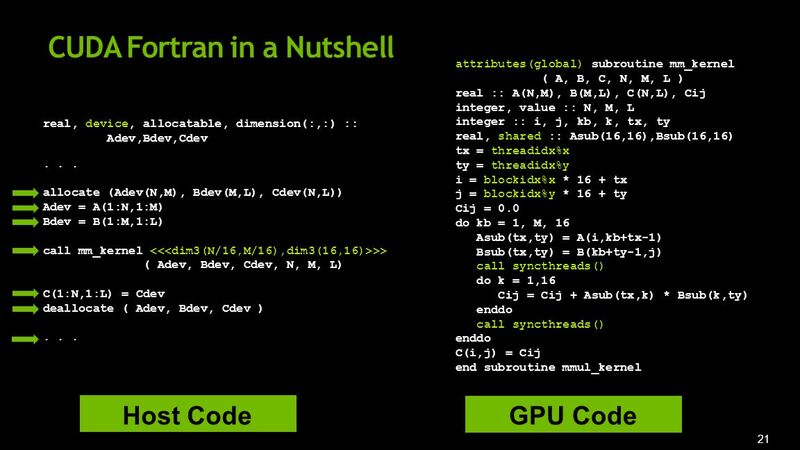 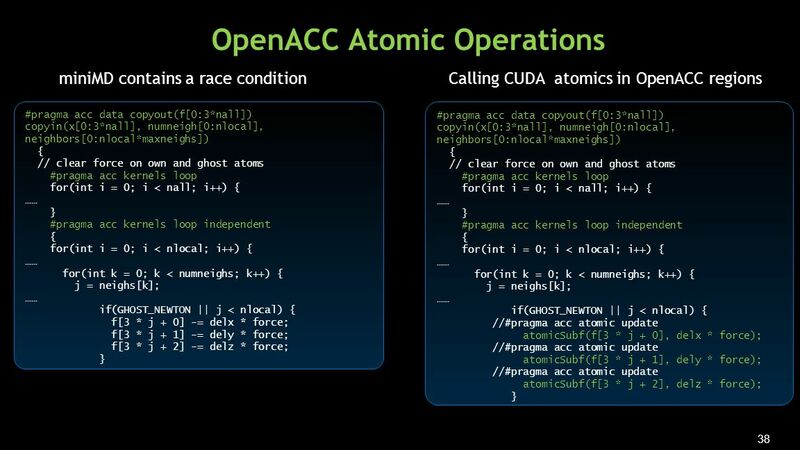 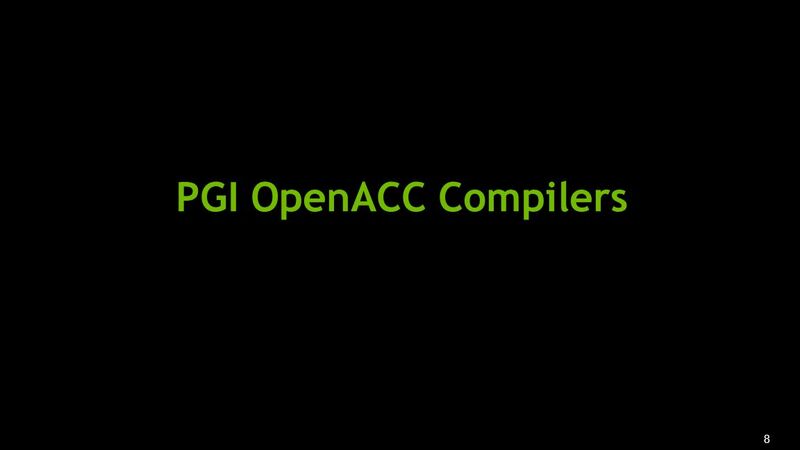 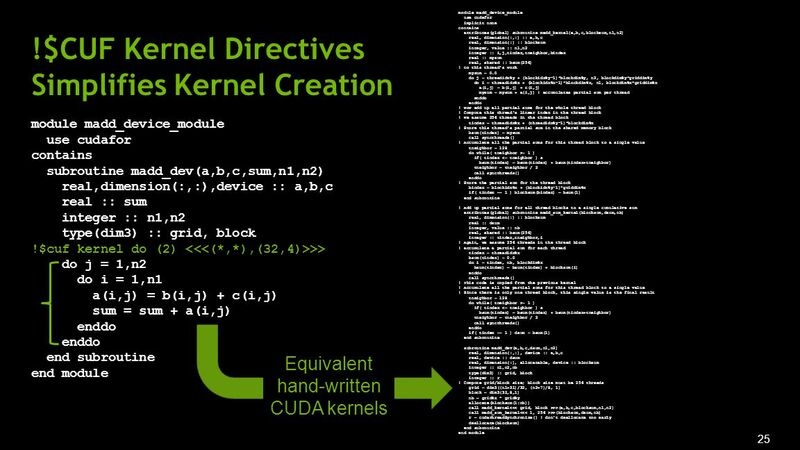 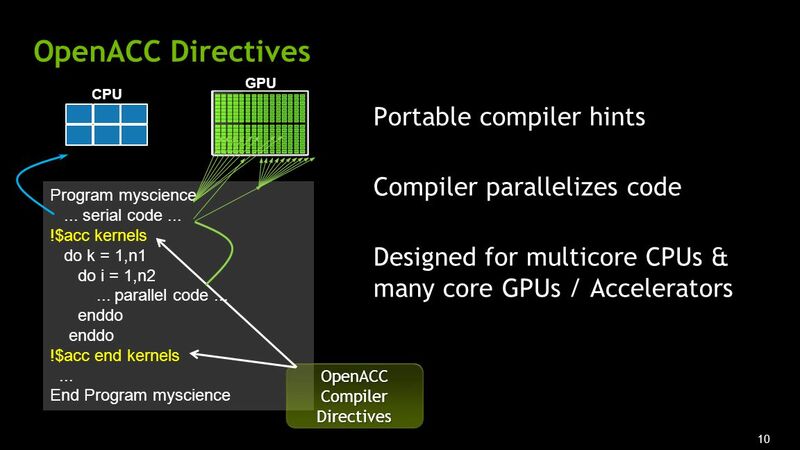 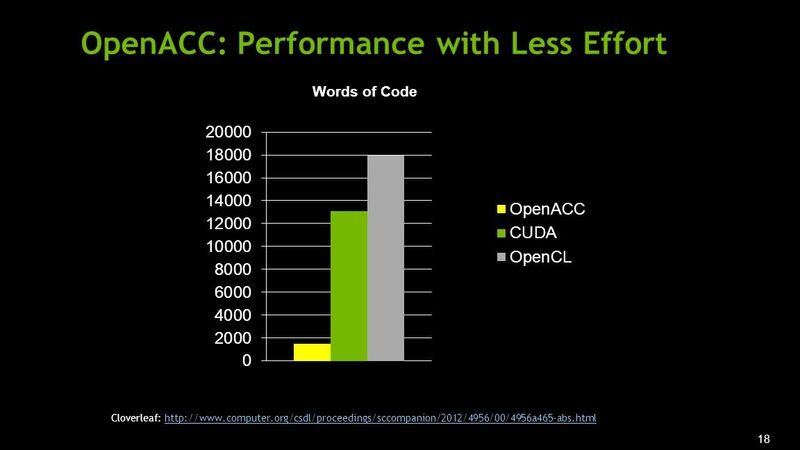 GPU Computing with OpenACC Directives. 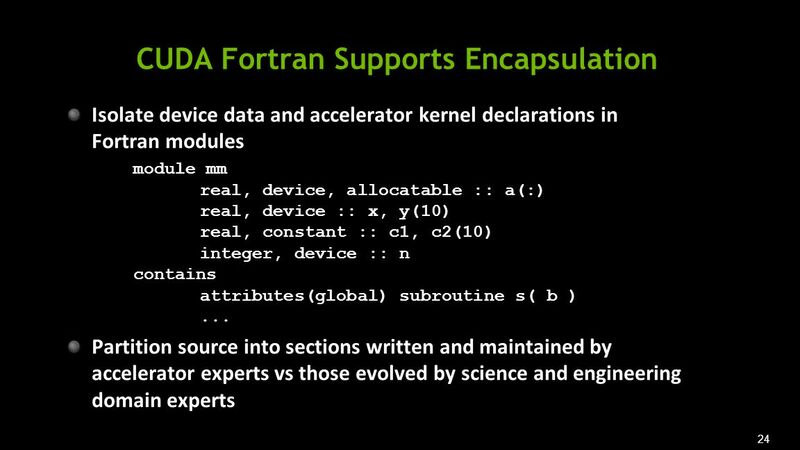 subroutine saxpy(n, a, x, y) real :: x(:), y(:), a integer :: n, i $!acc kernels do i=1,n y(i) = a*x(i)+y(i) enddo. 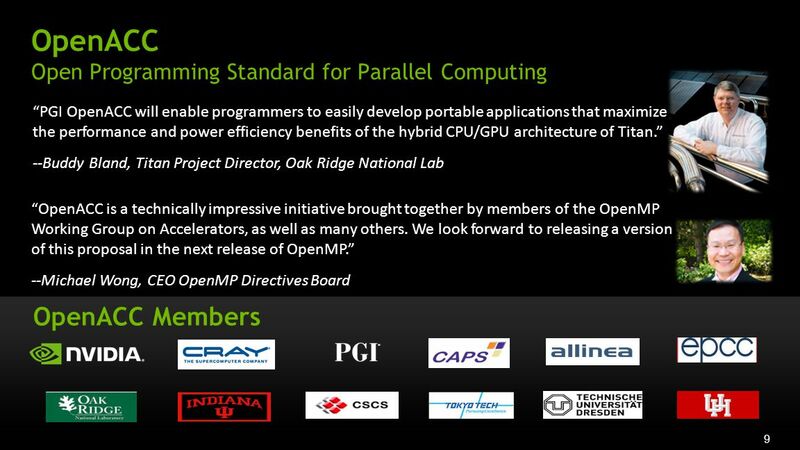 OpenMP Optimization National Supercomputing Service Swiss National Supercomputing Center.